A security officer who lost his finger, allegedly after Tumi Mokwena shot at him, says the attorney fired without warning. A security supervisor at the Zebediela Citrus farm, Klaas Mboweni, testified that Tumi Mokwena, a prominent attorney best known for being one of EFF leader Julius Malema’s lawyers, shot at workers without firing a warning in what he called an unprovoked attack, The Sowetan reports. Mboweni accused Mokwena of “randomly” firing at the workers, who were chanting for the lawyer to show himself so they could confront him over a salary dispute, leading to Mokwena allegedly firing at the workers. Mboweni was reportedly caught in the crossfire, leading to his finger having to be amputated. The incident took place back in 2017, when Mokwena was released on R10,000 bail, and the attorney’s trial is now being heard at the Polokwane high court. He faces four counts of attempted murder. 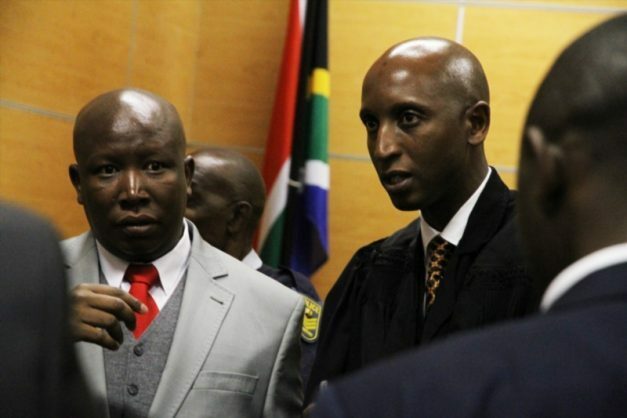 Malema appeared in court to support his lawyer during the 2017 bail hearing. Mokwena represented him in his dispute with the SA Revenue Services (Sars) and the land invasion cases in KwaZulu-Natal and the Free State courts. It is alleged that when Mokwena visited the estate in connection with five workers who had salary disputes with its management, a group of angry farmworkers confronted him with sticks and stones, and demanded that he leave the property. The group accused Mokwena of failing to pay workers while he was part of the farm’s management in 2016. When the workers blocked his way when he tried to leave, Mokwena allegedly shot them and injured four employees. At the time of the bail hearing, Malema defended the lawyer as innocent. Speaking to reporters outside the court, the EFF leader called for peace, saying he wanted to meet with the farmworkers to understand what led to the confrontation between them and Mokwena. “We believe that Mr Mokwena is innocent, and it will be proven in court, and we have full confidence in our judiciary. We hope that the sooner they resolved this matter the better,” Malema said.